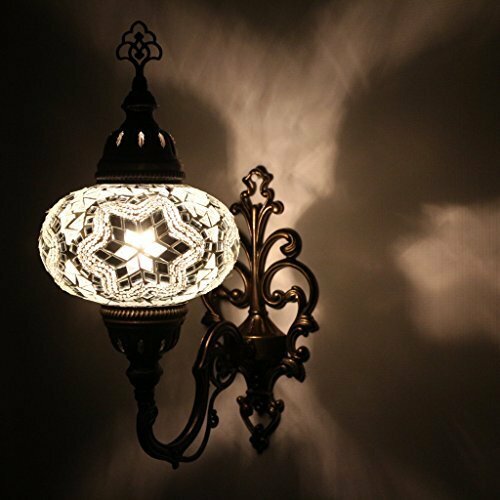 This Unique, beautiful and authentic handmade Turkish Mosaic Wall Sconce Lamp is made in Turkey with excellent quality. Our lamps are brand new and are sent in original packaging to provide safe and secure International delivery. WIDTH: 6.5" (17 cm) in diameter hand-blown Large Size globe. HEIGHT: 14.3" (34 cm) with 10.5" (26 cm) width. If you have any questions about this product by TI Lighting, contact us by completing and submitting the form below. If you are looking for a specif part number, please include it with your message.